It is early, but i am trying to get to bed just a bit sooner than usual. Thirty, even twenty years ago, Friday mornings, or any morning to be truthful, used to be a lot easier. In ten minutes, i would arise, jump out of bed, brush my teeth, grab a bite or not and certainly a cup of coffee on my way to the golf course and our tee time around 7:00 a.m. Now, there are a whole lot of ablutions and other morning necessities which should not be mentioned in polite company of whom i hope we are in required before i take off around 5:30. So tonight, i will set my alarm (on low volume to not disturb my sleeping beauty Maureen more than necessary. It won’t matter because i always wake up for an old man’s business trip about forty-five minutes or a half-hour before the alarm. No matter when i set the alarm. That is just right to keep me from going back to sleep before the alarm goes off. Which is, in some ways good: Maureen will rest better. So i am scurrying around the office, shunning the college basketball games, and that’s okay because Maureen wanted to watch a chick flick or something anyway after her wonderful dinner…er, supper of white bean chili, her incredible salads that once allowed my father to pronounced he could have been a vegetarian which i doubt very much because that man did love his country ham, steaks, pork chops, fried chicken, bacon, and Tennessee sausage. Thus, i am trying to get done all of the things i had on my plate today to make the load a little lighter in the honey-dos and my-dos, the lists that keep getting longer, not shorter when i get home from my golf game and of course, my NORP, a requirement when i really don’t get to bed any earlier and wake up thirty to forty-five minutes before planned. i was working hard on several posts, one an edited version of a 2009 column in The Lebanon Democrat. i began looking for a photo of my mother, a particular one. Of course, i couldn’t find it, in my computer files, in the cloud, or an actual photo. It’s there, but tonight to verify i really am electronically, technically challenged (and several other challenges) the photo in all of its forms disappeared from view because i only have eyes…oh, excuse me: that’s a song lyric i can’t get out of my head. It was the thing to do in 1918. Put your photos of your children on a post card and mail it for what? Two cents. 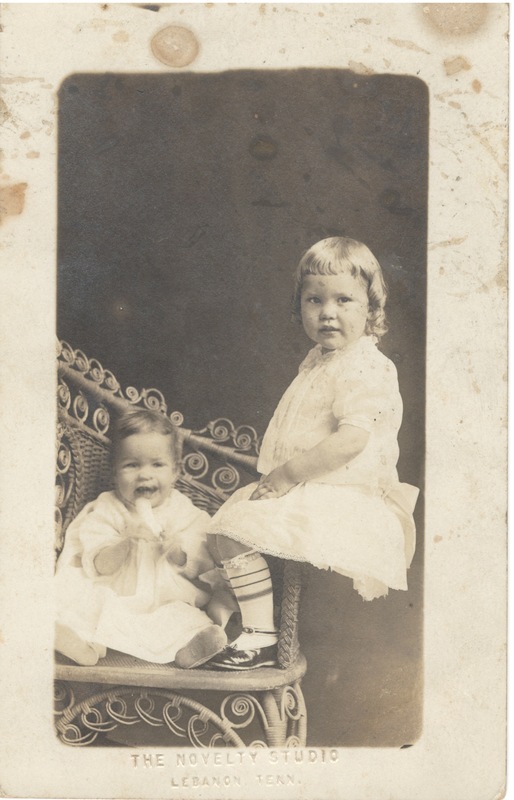 That is my mother, Estelle Prichard (Jewell) on the left and my aunt, Evelyn Prichard (Orr) on the right. Oh, what a world it must have been. So simple. So small. So country. “The Novelty Studio / Lebanon, Tenn.” it reads. Don’t know about that one. All i knew was “Seat’s. ” Even that was a long time ago when the world revolved around home, home town, family, folks. And they sang “Bringing In the Sheaves” and they brought in the sheaves and it had some problems but folks were folks back then and there and sometimes i wish i were there then.